Chavar Dontae, an American singer, songwriter, multi-talented musician, and recording artist that has traveled the music scene with the contagious sounds of indiesoulrocknroll. Dontae, is a true artist from the Midwest whose juxtaposition of soul, rock and indie electronic music is conscious of introducing audiences to real life scenarios of struggles through music recordings and live performances. Chavar grew up in Toledo, OH experiencing the influence of the Ohio music scene birth of many extraordinary musical artists. Graduating from Bowling Green State University in 2004 with a Bachelors in Music in Guitar Performance, Chavar attended master classes with Multi-Grammy Award winning musician Yo Yo Ma and legendary bassist Ray Brown. 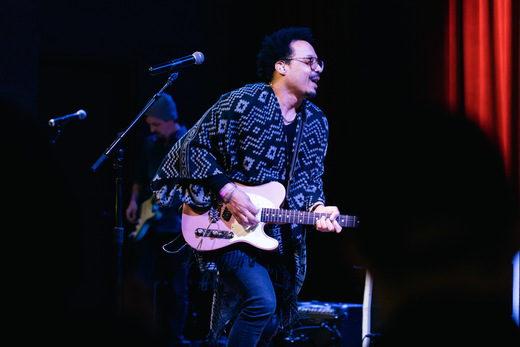 For almost a decade, Dontae has been the face of an alternative rock band that has toured the Midwest and west coast with the contribution of lending vocals and producing and arranging tracks for other artists. In 2010 Chavar decided to change directions and spearhead a new project debut music release with a radically different sound and style of music. With influences ranging from Jimi Hendrix, John Lennon, and Prince to Imogen Heap, MGMT, and Cee-Lo Green, Chavar is nothing less than innovative with this fresh style of music that keeps him close to his true music roots of soul. While maintaining his education in classical and Jazz guitar composition, Chavar’s 2011 debut EP, “indiesoulrocknroll: about a girl from westland”, incorporates synth-pop for a unique, contemporary sound. The name of the EP is a marginal implication to the eclectic, bold mixture of styles on the record. Chavar Dontae releases his highly anticipated follow-up single ‘Baby It’s You,’ to iTunes, MySpace, Amazon, Emusic, Google Play and Spotify, on Tuesday, July 16, 2013. ‘Baby It’s You’ which was mixed and co-produced by Dylan Ely who has worked with Grammy Award Winning Artists such as Linkin Park, Ludacris, Jennifer Lopez, R Kelly, Donald Lawrence and Lyfe Jennings. ‘Baby It’s You’ was mastered by Chris Gehringer who have worked with award winning artists such as Lady Gaga, T.I., Rhianna, Snoop Lion, Robin Thicke, Whitney Houston, and Chrisette Michele. This release follows the great and ongoing success of his single/music video/short film, ‘On My Way,’ which has received much acclaim throughout the country. Since releasing his debut EP in 2011, ‘indiesoulrocknroll: about a girl from westland’ and releasing ‘On My Way’ (2012), Chavar has received great press and acclaim for his work. He has opened for Mike Posner and his latest music video/short film has been mentioned several times by MTV/MTV Hive. Currently, ‘On My Way’ sits atop the Top 40 on Ourstage.com, an MTV affiliate. It has been listed for several months and has even made its way into the Top 10. Most recently, Artists.MTV named Chavar “Artist of the Day” (2013) for work on his short film/music video, ‘On My Way.’ MTV Hive has mentioned Chavar more than several times and MTV mentioned his MTV page on the social networking site, Pheed. ‘On My Way’ has been a fan favorite, as it was a 2012 Texas Film Festival Official Selection and also a two-time winner for the “Once A Week Online Film Festival Audience Award Winner.” As well as 'Baby It's You' earning 2014 Texas Independant Film Festival, 2014 SHORTSNONSTOP Film Festival Canadian Film Centre for it's placement as the primary song in Kleptos.